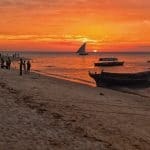 Our 11 days The Best of Both Worlds Tour takes you up to Africa’s highest peak and most marvellous beaches. 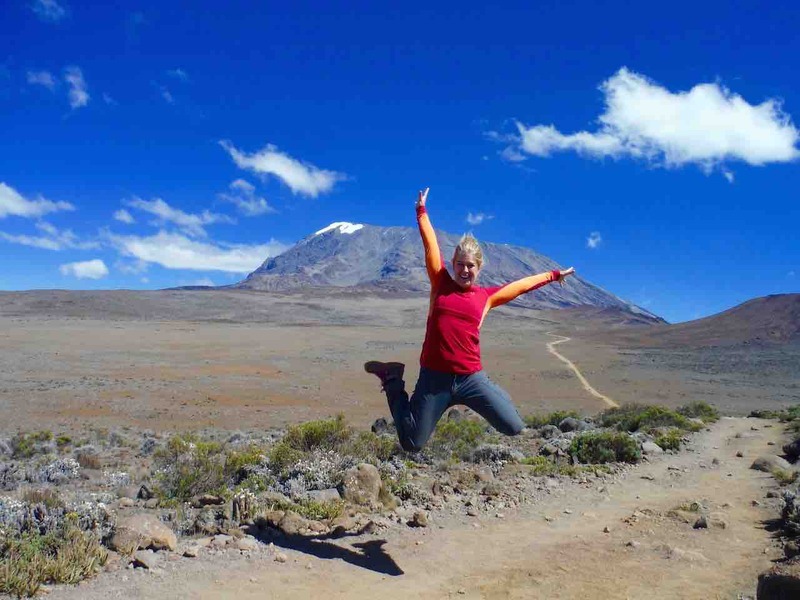 You will climb Kilimanjaro via Machame Route, which is one of the best routes due to the marvellous scenery and excellent climbing conditions. Panoramic views of the immense ocean of ochre yellow sand that covers the radius of the moorland regions, the emerald rainforests and the gleaming fields are unparalleled. You will traverse over the ancient, glaciated river valleys of the frosty southern slopes. 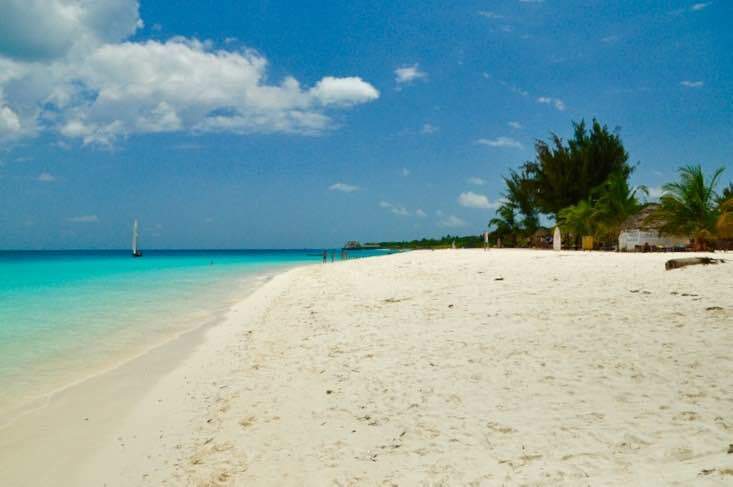 After this unique adventure we take you to the endless sandy white beaches of Zanzibar, where you will relax and unwind for the next 4 days. 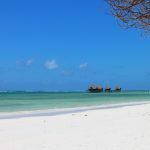 There are numerous historical locations but Zanzibar beaches are heavenly so you can soak up the sun rays or soak up the knowledge – the choice is entirely yours. A driver will pick you up from the airport and take you to the hotel where orientation will take place. Your guides will provide you with detailed information on your trek and they will examine your gear. Day Two: Moshi to Machame Gate (1,800m/5,905ft) to Machame Camp (3,000m/9,840ft) Elevation Gain: 1,200 meters, 3,935 feet. 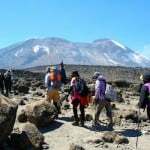 On your 6 days Machame Route your crew will accompany you at all times so you will have an opportunity to meet them beforehand. In the morning we will depart for the Machame Gate and venture through the coffee farms and local villages during the 45 minute drive. Upon arriving you will wait at the gate whilst we register your climb and the porters and guides complete their last preparations. Our final destination for the day is the Machame Camp. We will begin by hiking through the timbered underpass of Kilimanjaro’s moss covered cloud forest. Towards the end of the hike the forest will start to fade and the transformation of the vegetation is drastic. Wildflowers, high grasses and heathers will sprout out of nowhere. A cloudless sky will reveal the ultimate destination, the Kibo Peak. The porters and cooks will advance to ensure that the camp is organized by the time you arrive. Today’s hike is considered to be the easiest on the 6 days Machame route but there are numerous uphill intervals. The trail is exposed and on a clear day the sun can assist in exhausting you so we urge you to carry plenty of drinking water. You will have several opportunities to view the marvellous forest canopies and the golden plains of the savannah that lie below. Above the towering Kibo mountains and the jagged peaks of Mawenzi make their presence known. 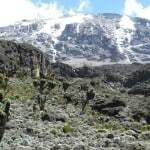 The vegetation transforms as the altitude increases – the trees begin to shrink the infamous high altitude plants of the Kilimanjaro, the Lobelia Deckenii and the Scenecio Kilimanjari, begin to emerge. You will climb to the Shira Plateau after lunch. When Kibo was still an active volcano, the lava seeped to the Shira Crater and filled it. We will end our hike at the Shira Camp where you will relax for the rest of the day. Kibo lies to the West and Mount Meru to the East. The trail on this day can be described as temperamental. It is up and down but the elevation gain is only 110 metres which seems insufficient but contemplate the fact that by lunchtime you would have already climbed a gruelling 690 metres to a height of 4,530 meters. 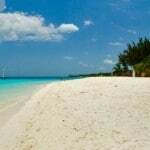 This is a vital day for acclimatisation so it is important to try to keep up. You will begin by hiking east on the expansive Shira Plateau. Your first milestone is the junction for the Shira and Lemosho Routes. At this point you will continue through the barren setting until you stop for lunch. We will reach the maximum position of the day shorty after lunch and then we will have a rapid descent to the Barranco Camp. If you are a faster hiker you can take an advantageous detour by means of the Lava Tower – a towering three hundred foot lava creation that protrudes out of the mountainside. The Barranco Camp is regarded as the most scenic campsite on the 6 days Machame Route. The significant hike to the Barafu Camp will commence once you have finished your early, energy dense breakfast. The day launches straight into the challenge – a taxing, ninety minute climb up the Barranco Wall. Some areas require you to support your own body weight as you pull your body up with your bare hands. Once we reach the top we will descend into the greener territories of the Karanga Valley. The journey offers several vistas of Kibo’s gleaming glaciers and we will hike near the Heim, Kersten and Decken Glaciers. There is also a vantage point that allows you to observe the junction that connects the Machame trail with the descending route. 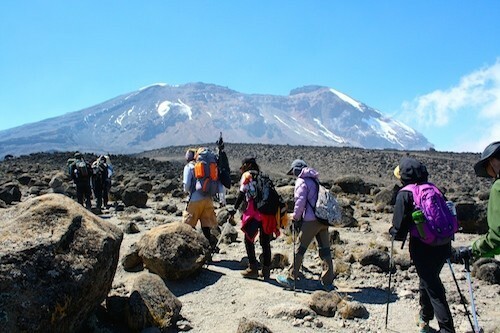 The trail is a bleak alpine desert that ranks low in comparison to the previous day’s scenery but once you reach the Barafu Camp you will recognise that it was a worthwhile trek. 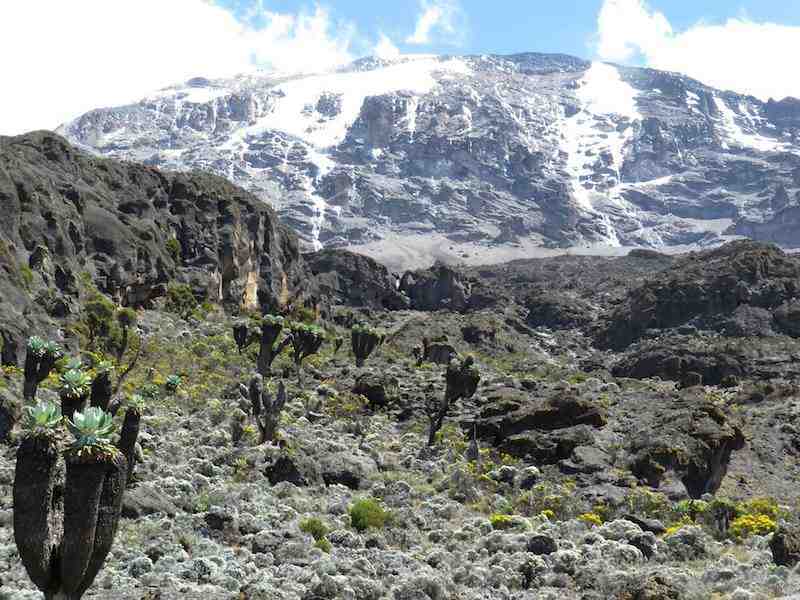 The stunning view of the bronzed Kibo and the Mawenzi Peak contrasts with the bleached Rebmann Glacier sublimely. Resting immediately after dinner is recommended as we will embark on our trek to the summit slightly after midnight. We will begin the final ascent to the cloud covered Uhuru Peak, Africa’s highest point. Your headlamp will illuminate the trail for the next six hours. The ascension to the crater rim is the most strenuous mission on the entire trek. The gradient is incredibly steep until you reach Stella Point. 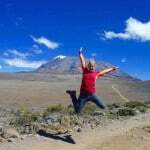 The high altitude causes the hike from Stella point to Uhuru Peak to be arduous and slow. This lasts approximately one hour until you reach Uhuru. Once you conquer the summit, you can take photographs and marvel at the landscape. We will start making our way towards the Mweka Camp and there are countless spectacles to witness at a new angle including the mountains, craters and glaciers. You will hike amongst the wispy clouds and their beauty will enchant you. When we arrive at the Barafu Camp we will pause for breakfast. After breakfast we will spend the next three to five hours walking to the Mweka Camp. You can spend the last night star gazing and reflecting on your triumph. 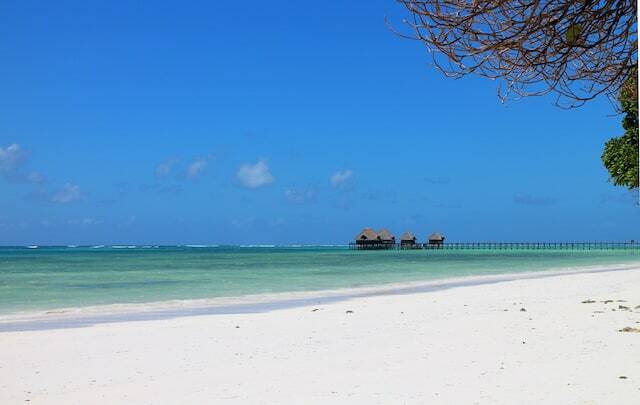 After breakfast we will embark on the last leg of our journey, a stroll to the Mweka Gate. We will pass through the mystical cloud forest again but we ask that you remain cautious as the trail on the way down can be slippery. Once you reach the gate, you can purchase sodas and t-shirts. 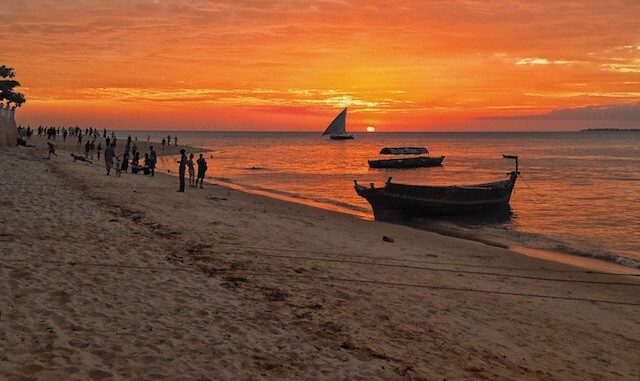 A Viva Africa Tours vehicle will transport you back to Moshi.